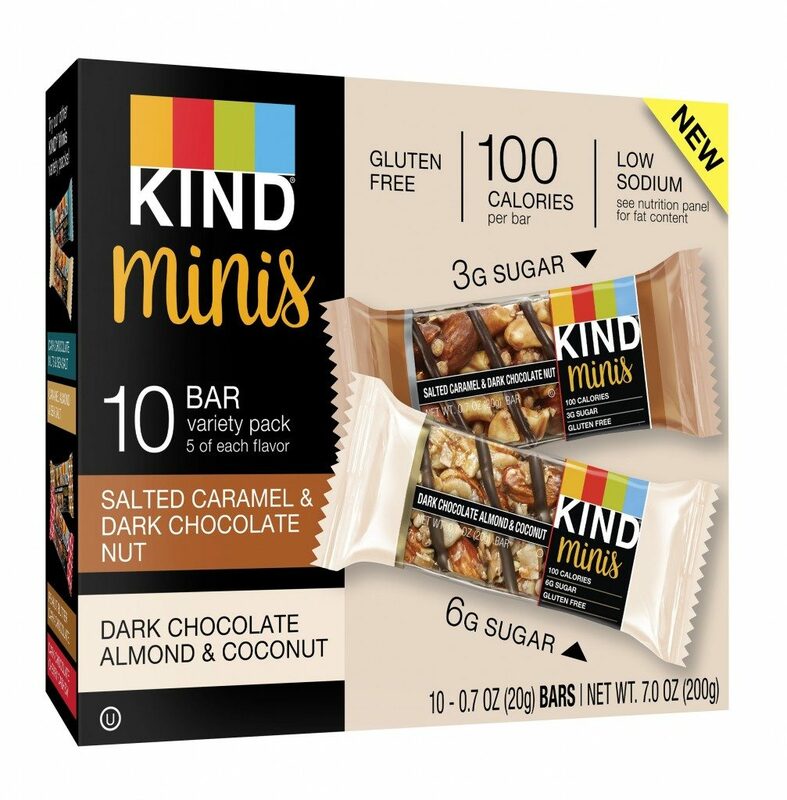 Today KIND Healthy Snacks (KIND) announces the national introduction of KIND® Minis and in the process redefines the small portion snack category that has been comprised of empty calorie options for decades. To date, most food manufacturers have failed to make reduced portion snacks that effectively balance health and taste. The 100-calorie or less KIND Minis aim to fill a need for people seeking on-the-go snacks that not only taste good but also offer balanced nutrition. When compared to bestselling lower calorie snacks on the market – from cookies and crackers to salty snacks1 – KIND Minis have more nutrient dense ingredients and provide a greater amount of positive nutrients, like protein and fiber, while containing less refined carbohydrates. Like all KIND snacks, KIND Minis have a nutrient-dense first ingredient. Three bars lead with almonds; two lead with peanuts and one leads with cashews. Select bars also contain fruits, such as cranberries and cherries. Flavors include bestsellers such as Dark Chocolate Nuts & Sea Salt; Caramel Almond & Sea Salt; Peanut Butter Dark Chocolate; Dark Chocolate Cherry Cashew; Salted Caramel & Dark Chocolate Nut; and Dark Chocolate Almond & Coconut. “Many leading miniature snacks are just smaller versions of their nutrient-deficient full-size counterparts. We opted to create a snack with a minimally processed, nutrient dense first ingredient like nuts versus enriched flour or refined sugar,” says Stephanie Perruzza, Registered Dietitian and Health and Wellness Expert at KIND. The KIND Minis introduction is consistent with KIND’s heritage. In 2004, the company created a new healthy snack category when it unveiled a line of bars made with whole nuts and encased in a transparent wrapper. Since then, the company has rolled out more than 70 different snacks. The full Minis lineup will be available online and at retailers nationwide. To learn more, visit KindSnacks.com.